Ever wonder who the guy is in this meme that continually makes the rounds on Facebook? Well I did - and I found out...and it is frightening. Seems this young man used to be known at Pauly Unstoppable. 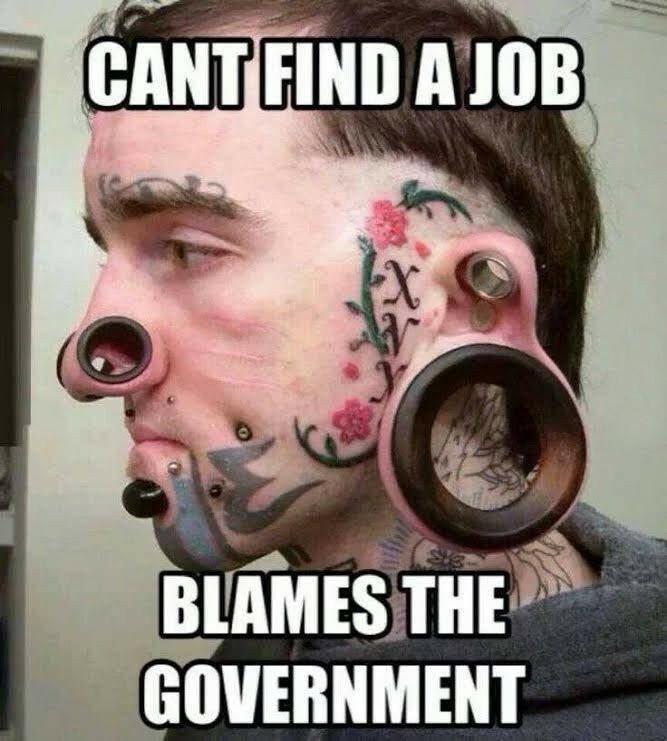 Funny thing is...at the time the photo used in the meme was taken, he could in fact find a job and was working in a Spencer's Gifts store in a mall in Indiana. 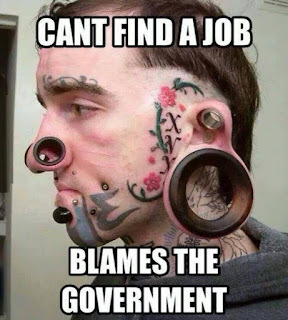 In fact he must have always been able to "find a job" because he has spent a small fortune disfiguring himself. So poor Pauly has much bigger problems than finding employment. 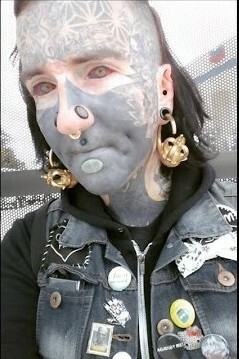 He can't seem to stop with his "body mods"...even having the whites of his eyes tattooed. Satan has been having a field day with him and a few years ago Pauly decided he was in fact a woman and has undergone gender reassignment surgery and now goes by the name Farrah Flawless. Watch this video and you decide who he has given his life over to. 1 Timothy 5:15 For some have already turned aside to follow Satan. That is really sad. With all of his satanic markings, Satan will for sure recognize his child unless he repents and becomes a child of God. So sad. I always feel people that are like that must have a lot of torment in their lives. and I'm a deplorable ? Many different groups of people in this country with all kinds of activities. I have a lot of shots of a big TX drag show in San Antonio I was asked to visit a few years ago. I knew some of the people and it was a riot. I laughed through most of it. But the photos I have did not do it justice. Afterwards I went back and told them what a good show it was and I was looking up at a gorgeous 6 ft. 6 in. Bouffant blond lady from Houston. There are a lot of tattooed and pierced people and who have whole body tattoos. I have none yet. Mine would be boring like=Mayflower descendant. I said I can't think of one funny enough to make the doctors laugh when I die. So I guess I'll just be a deplorable like Rev. Well, I have to explain. Actually the show was given by former alcoholics and drug addicts in AA and NA to raise money for a big International Convention hosted world-wide in San Antonio. And the girls made homemade food, etc. at the show to raise more money. It was a big success. There must indeed be some strange force compelling one of God's creatures to "re-create" himself. Sad. Wonder how he blows his nose. If he gets a cold, he probably has one heck of a post nasal drip. Korn meets Christ. The conversion of Brian Welch. Jesus you are the One and Only rescuer who can take anyone from Satan's hands and turn him/her into a testimony for you. We turn this wounded soul over to you. All Glory to you. I could not watch the video. This man must be in torment. But there are those who are beautiful or handsome and walk around every day that belong to Satan too. We are in a war that only Jesus Himself won at the Cross. Pauly, Pablo, is this a dig? I doubt these are the same guys. In first photo with limited tattoos he has huge gauge earrings. In the second heavily tattooed headshot there is no evidence of enlarged gauged earlobes. But if it fits your particular social, political or religious narrative, go ahead and take cheap shots at those who are unlike you or that you don't understand. Steve...this is the same person. Do your own research and prove me wrong. Satan is very real as is his obvious influence in the mans life (by his own admission - disfiguring himself and embracing satanic markings on his body). Hardly a cheap shot... 1 Corinthians 6:19 What? know ye not that your body is the temple of the Holy Ghost which is in you, which ye have of God, and ye are not your own? In you. He just decorated his temple according to his aesthetic desires like some people do with purple hair, crimson nails and lipstick and various pierced earrings, etc. What style is right? God is the judge. In an old Twilight Zone sequence there was a show I liked. The doctors and nurses in a hospital surgery were working feverishly to operate on a person and make the person o.k. And right. At the end of the show, we saw the patient person and he was one of the most handsome white males with blond hair and blue eyes. What an American marvel. Then we saw the nurses and doctors who were trying to operate to make the patient normal. The doctors and nurses were deformed and hideous people by our standards but they were the norm in their culture. Steve's point is well taken though. Isn't this young man, outcast and weird and tormented, exactly who Jesus would embrace and tell to go and sin no more? Is it only us non-Christians that understand what Christ was about? Jeez(us)! Atheists love to try to turn the tables on Christians based on their own misunderstandings. This is how it works for those of you who don't understand. God gives man free will to choose as he pleases - whether that be good or evil. Jesus died on the Cross so that all who believe in Him will have a chance for redemption - no matter what their earthly deeds. God never coerces man's will, rather God gives the ability to believe through the work of the Holy Spirit. Unfortunately, too many are drawn to Satan whose lure is based on deceit and earthy pleasure which is very strong. God doesn't tell you which path to take. The Bible is the instruction book...and those who refuse it may be lost but always have that one last chance thanks only to the death of Christ - who sacrificed Himself for you and me and all mankind. Galatians 2:20.